At Brightworks we have certain traditions in the beginning of a new arc. Gever always gives a presentation that covers the scope of the arc topic and the bands always have some sort of brainstorm where they map out their interests. Given that the Arc is By Land, I was expecting that my students would want to make some sort of vehicle, but no! When we sat down to brainstorm the Blue Band expressed an overwhelming interest in studying how early people migrated across continents and how the First Peoples in North America lived. In the past weeks, the Blue Banders have explored the most basic of by land transportation: Walking! What circumstances and mutations led to humans’ ability to walk? We uncovered some answers in the documentary The Origin of Us by Dr. Alice Roberts and in the copious books we brought back from the library. We learned that walking upright also freed early human hands to create tools. 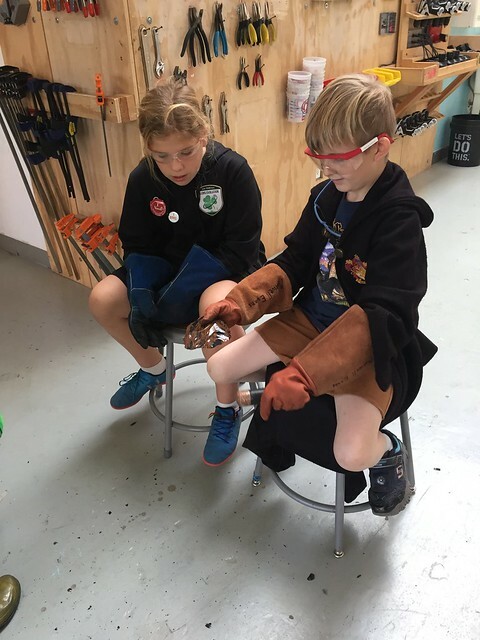 We were visited by three experts in the evolutionary relevance of flint knapping! Last year Selina, Huxley and Freddie made a documentary about this very topic. 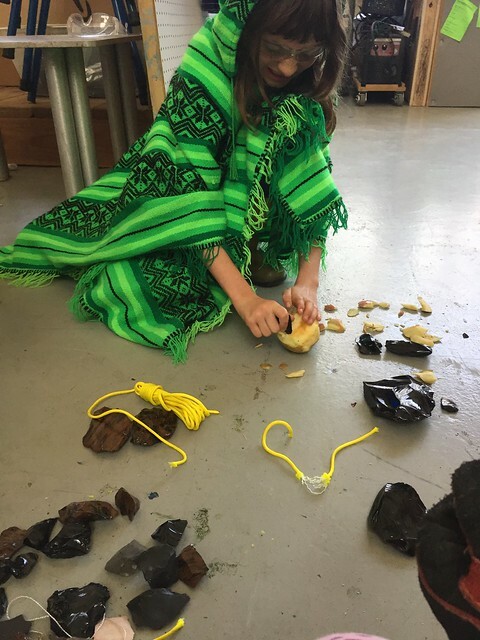 In the process of making this documentary, they learned how to make stone tools. After establishing safety guidelines and explaining how obsidian shatters in what is called a Hertzian cone. 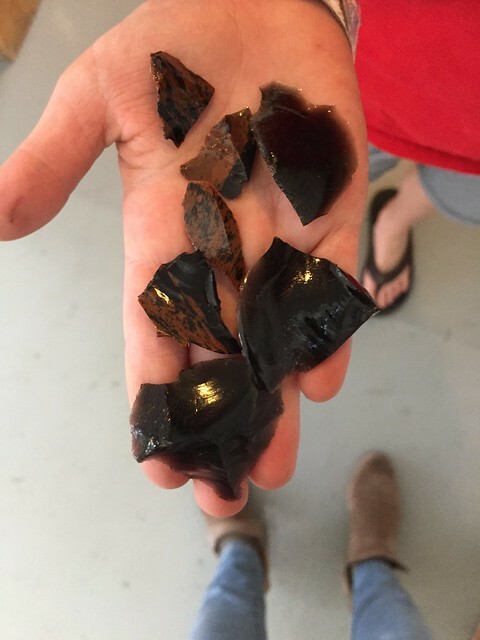 Huxley, Selina and Freddie showed the blue banders how to make their own obsidian and chert flakes. The Blue Band got to use their creations to slice through cordage and cut an apple. Giving them some insight into what it may have been like to rely on stone tools of their own creation. The Blue Band has started a new novel study to accompany our study of First Peoples. 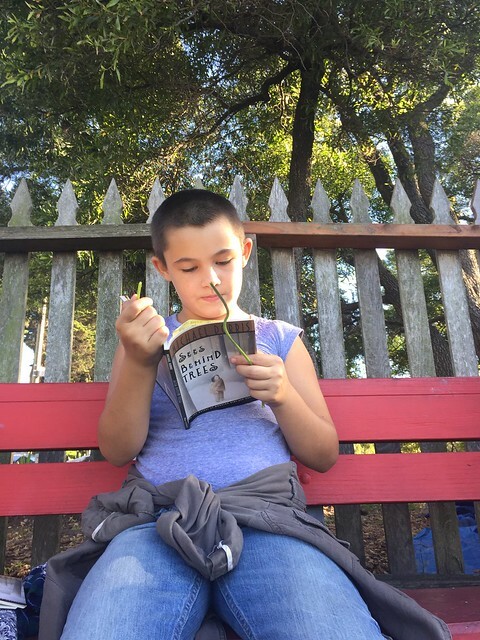 Sees Behind Trees, by Michael Dorris, is a coming of age story about a nearly blind boy who learns to use his other senses to find his place in the tribe. This beautifully written book has been a great resource to us as the band writes their novels. 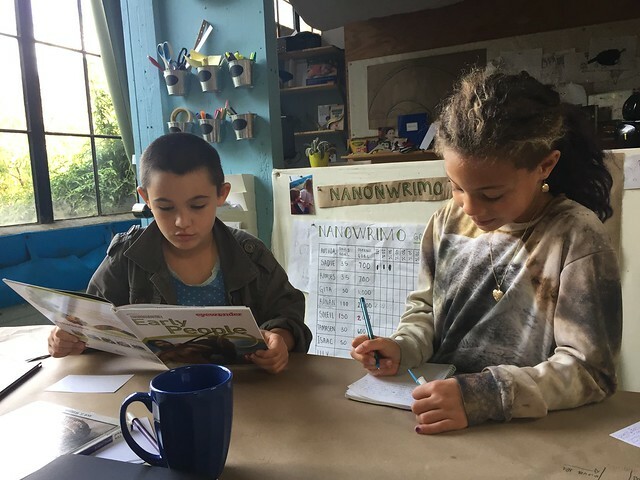 We’ve been savoring the rich language, noticing how the author builds suspense, and keeping track of all the different ways to say, “said”. 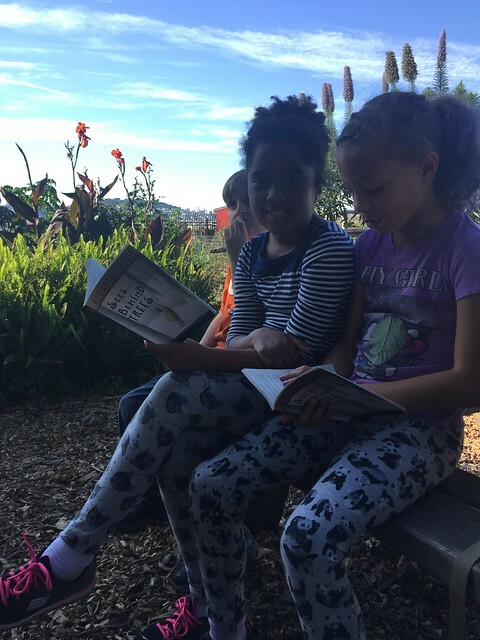 So much about reading a novel is about empathizing with another person’s experience. 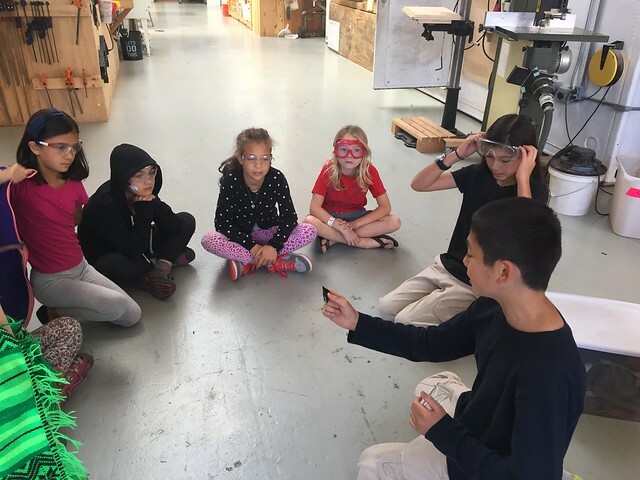 To connect with the main character in our story’s experience we’ve been playing games and taking on challenges that put us in our own senses. 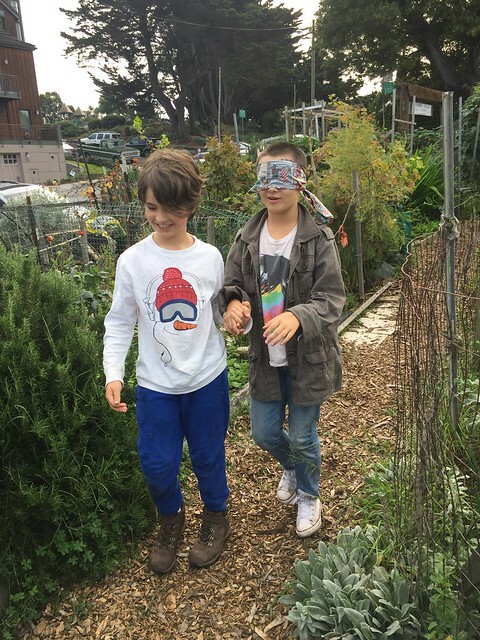 At Potrero Hill community garden the Blue Band lead each other on blindfolded sense walks. 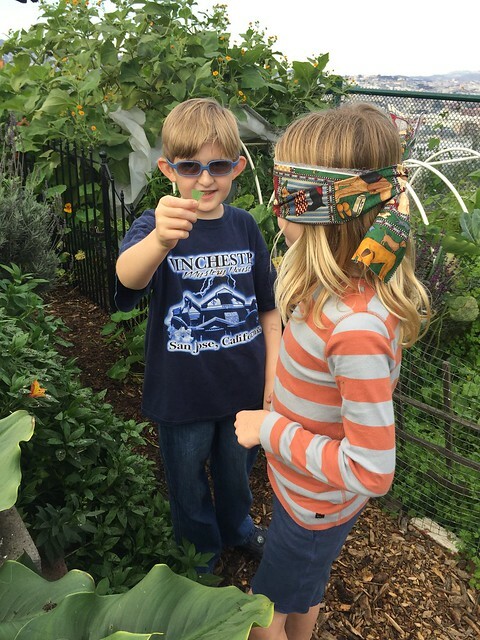 Ramses gives Ronan sprig of mint to taste and Isaac leads Sadie down the trail. To delve deeper into what it might be like for our main character we turned to one of my favorite podcasts Invisibilia. This episode tells a story of a blind man who explains how other people’s expectations of him helped him to see. Because his mom expected him from a young age to do all the things a person with sight to do he developed a way to navigate the world just like everyone else. What a wonderful path these kids chose. I’m excited to continue exploring it with them! This entry was posted in Blue Band, brightworks. Bookmark the permalink.